12 of us gathered for this event in the lovely town of Hawarth in the South Pennines. Alan and Lynne, Paul and Janet, James and Barbara, Bob and Ann W, Yvonne, Ann L, Patrick and myself. We were a mix of those who did not know the area at all, or had not visited for many years, so we were all looking forward to some new walks. Our base was the Bronte Hotel on the northern edge of the town. We were made very welcome, and the general consensus was that it provided excellent value – both on the accommodation side and the meals as well. Patrick camped at Stanbury and that proved to be a good site as well. On Monday we walked the “Railway Children Trail”. This had been designated, of course, because Howarth and the Keighley and Worth Valley Railway, had provided the location for the film made all those years ago with Jenny Agutter, Bernard Cribbins et al. 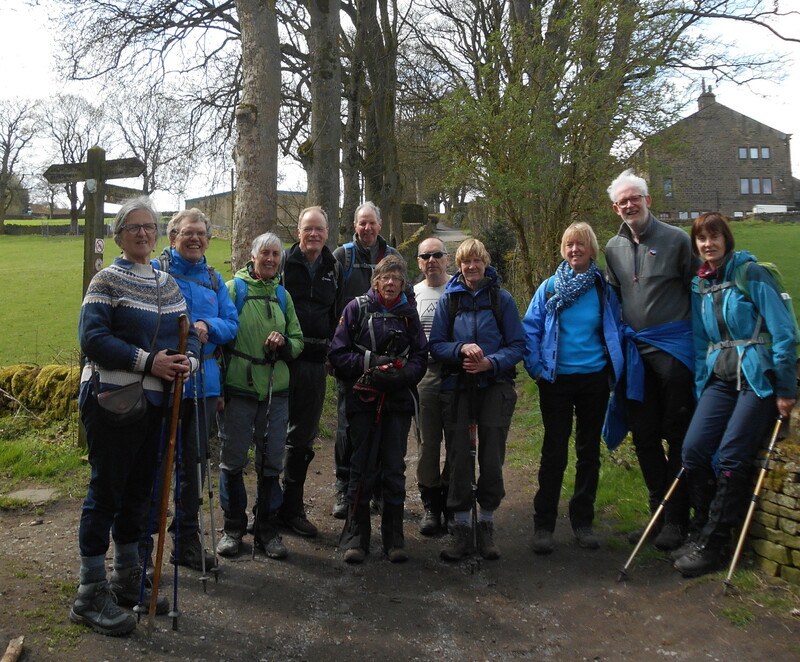 Our walk took us around the valley , up as far as Oxenhope and down to Oakworth, and through Howarth Village itself. It was a varied walk and whilst it was clear that our memories of the film were not that sharp (!) we did all remember the incident where the boy leading the paperchase went into the tunnel and sprained his ankle, and where Jenny Agutter attracted the train driver by waving her red petticoat! Various of us decided we might re-watch the film next time it was on the telly. This part of the Pennine chain is a real mix of moors, deep valleys and lots of industrial history. The buildings hereabouts are virtually all stone built in the local gritstone, and there are a number of very impressive farm houses in particular. All in all, a very different landscape from what we are used to further north. Many of us visited the Bronte Parsonage Museum during the allotted time in the village. A fascinating place and well worth the visit if you have not been. This got us in the mood for the Tuesday walks on the moor, with mutterings of Cathy, Heathcliff and Wuthering Heights! And as a bonus, we saw the steam train twice during the day, even though the timetable suggested no trains would be running. And was that the “old gentleman” sitting in one of the carriages? There were two walks on Tuesday. The shorter walk was led by Paul. This was a 4 ½ mile walk: “The Bronte Connection”, a circular walk just west of Stanbury. Just two couples set off on a very blustery morning. After 1-¾ miles the walk took them over Haworth Moor top to Top Withins farm and on to the Heights on Stanbury Moor, both sites associated with Emily Bronte’s novel “Wuthering Heights”.They tell me one could almost hear Cathy’s voice on the wind! Over the moor and down into Ponden Clough and past Ponden Hall, skirting the southern edge of Ponden Reservoir, the route then went into Buckley Green Bottom and back round to Back Lane and the car park. Perfect timing, as the rain started falling just as the group reached the car. Our final walk on the Wednesday saw the remaining party driving across the moor to Hardcastle Crags. This is a lovely wooded valley now owned and managed by the National Trust. The hoped for bluebells were only just starting to show colour, but the wood itself was delightful in the spring weather with trees bursting into leaf. A slightly prolonged stop at Gibson Mill, because we had arrived before opening time(! ), gave the opportunity of an early morning coffee stop and a chance to walk round the mill buildings. Following it’s original use as a cotton mill, the site had become an “entertainment centre” for the growing populations of this part of Yorkshire and Lancashire, particularly those working in the mill trade and other industries that had sprung up during the Industrial Revolution, and we learnt some of the history of the place. Time being pressing led to a slightly misjudged “short cut” on my part, although it was clear we were not the first to try the route, before we emerged out of the valley at Walshaw and continued across the moor round Shackleton Knoll and then into the delightful Crimsworth Dean via a lovely waterfall at Lumb Hole. The sun was well and truly out at this point and everything looked glorious. The falls themselves are interesting as two sources flow into the same point – a very peaty main river, and also a crystal clear and very full spring emerging from the adjacent hillside (presumably the eponymous “Hole”). We walked down the Dean to our cars at the end of what everyone agreed had been a varied and enjoyable break. Once again the 3 day pattern with shorter walks on the first and third days worked well. Any ideas for a venue for next year?